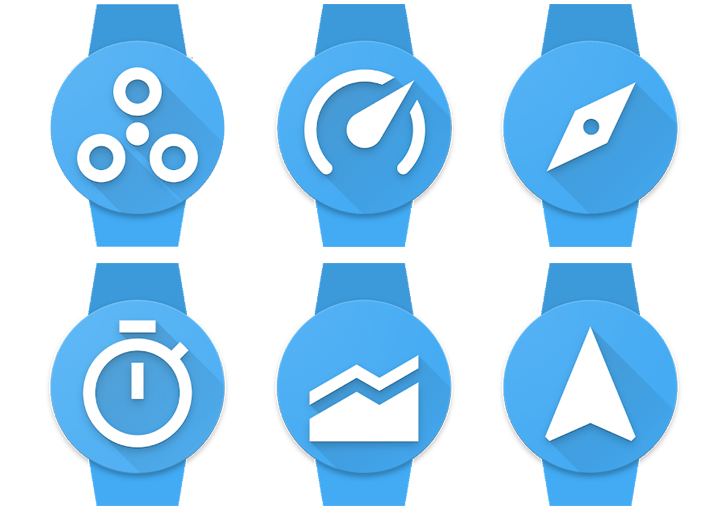 Appfour are one of the most prolific Wear OS (né Android Wear) developers. Their solutions for the smartwatch platform have spanned from the useful (like this WiFi manager) to the why-and-why-not (like this video player, PDF viewer, browser) and so much more. Now, they're bringing six new mostly GPS-based utilities to our smartwatches. Appfour's new apps comprise five new utilities — Altimeter, Compass, GPS Tracker, Speedometer, and Stopwatch — plus the all-in-one Instruments. Each one of these can be installed separately and act as a regular app, a watchface, or a complication for other watchfaces. That's actually quite versatile. All apps also have unit selections for settings as well as some bonus features, depending on their nature. The GPS tracker and speedometer, for example, can record data continuously. The apps are all free, but paying for some IAPs lets you unlock additional features such as a map view in the GPS Tracker and Speedometer, graphs of previous recordings for all utilities, and more settings. I tested all of them briefly and found that they did their job well. Only the altimeter seemed adamant about not showing me any values, but that might be because I'm indoors on the ground floor of a four-story building. If you want to give these apps ago, you can grab them from the Play Store widgets below.